Learning from our success using both the cars and snowmobiles to access sites during the fieldwork in Tottanfjella, it was decided to make a speedy return journey to Milorgfjella with the snowmobiles. This would hopefully allow us to visit the high elevation, summit sites we were unable to access during the first visit. In order to fit the snowmobiles and fuel on the cars, we had to significantly reduce the camping gear and go ”lightweight”. We were a team of just five for this trip. We took smaller mountaineering tents, and we cut out all luxuries – including the mess tent. We packed and strapped the cars on Thursday (9 February) evening, setting off early on Friday 10 February. We arrived and began building our camp at around 20:30. It was -27 °C, and the sun was beginning to sink below the horizon. This biting cold combined with the high altitude made even the simplest of tasks hard work. We would regularly need to take a break from setting up a tent, or starting up a stove and cooking dinner to take a run down the tracks, or do the penguin dance to warm ourselves up. 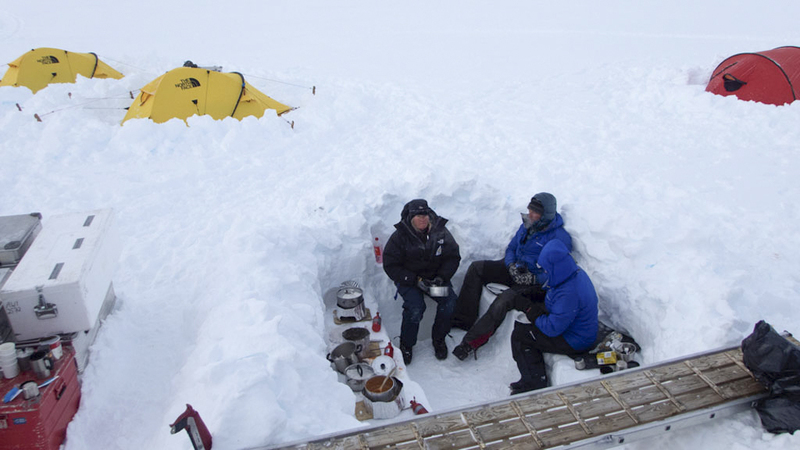 Thankfully there was a lot of snow digging to be done – a nice task for keeping warm. After setting up camp and, having eaten dinner (our noodles froze within minutes of being removed from the stove, so if you wanted to eat warm food, you ate quickly!) we wasted no time in heading to bed, knowing that getting into two sleeping bags (one inside the other) with a bottle of hot water was the only way to stay warm! The following morning we set off on snowmobiles to visit three sites we had highlighted on the satellite images as potential sample sites. It took no time at all to reach the first site, Lauringrabben, a small ”wannabe” nunatak just emerging from the ice. The bedrock here was a highly weathered. We spent the best part of an hour scouring the small nunatak for possible samples but didn’t find anything. We started to worry that all this effort to return here was for nothing. Our selected sites were close to one another and we could see our two other sites from Lauringrabben. These were the summits along the Milorgfjella range. 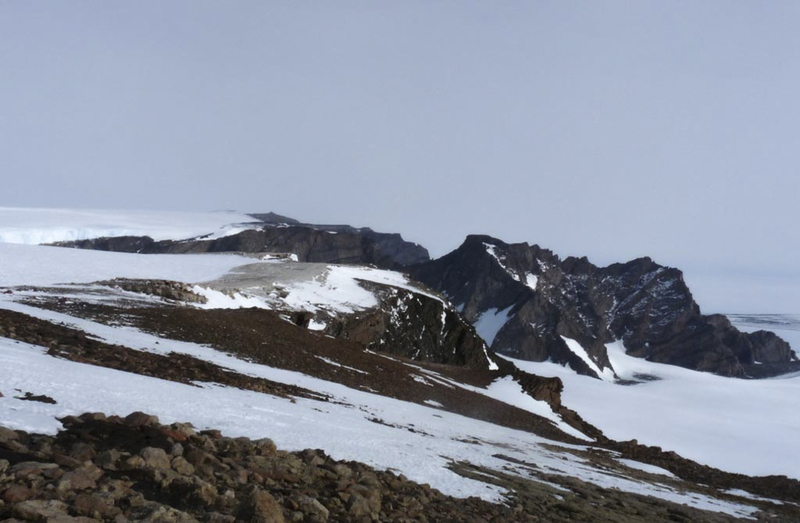 At both Milorgfjella and Tottanfjella, where we have sampled so far, the mountains (nunataks) form something of a barrier to the ice flowing from the interior of the Antarctic Ice Sheet out to the coast. 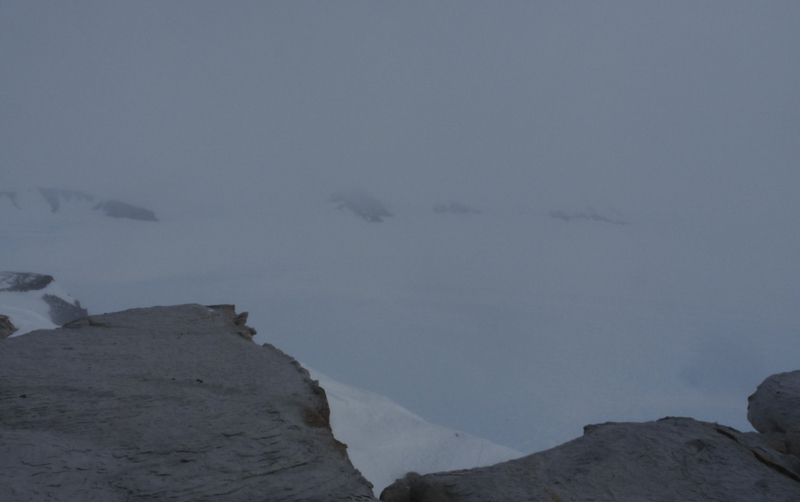 As such the ice surface on the southern side is at around 2,000 metres above mean sea level, and the present day ice surface is typically only 20–30 m below the summits. Yet the northern sides of these nunataks commonly form 500 m high vertical cliff faces with the ice surface at around 1,500 metres above sea level. The summits that seemed so daunting on our first visit here (when we approached from the north), are much easier when approached from the south. 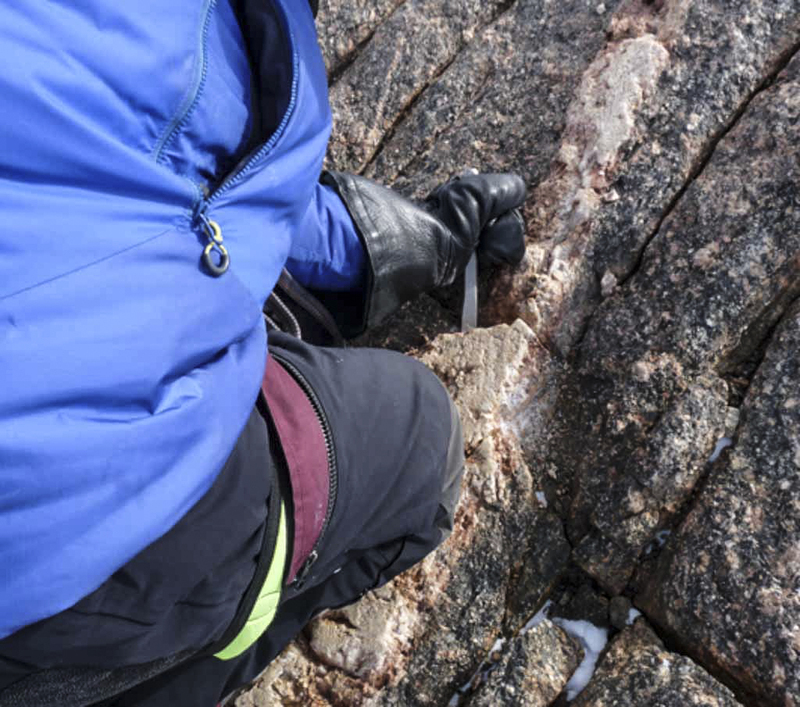 Here our efforts were rewarded as we found glacially polished and smoothed surfaces almost everywhere, including very well preserved striations – scratches on bedrock created as the rocks in the ice pass over it. 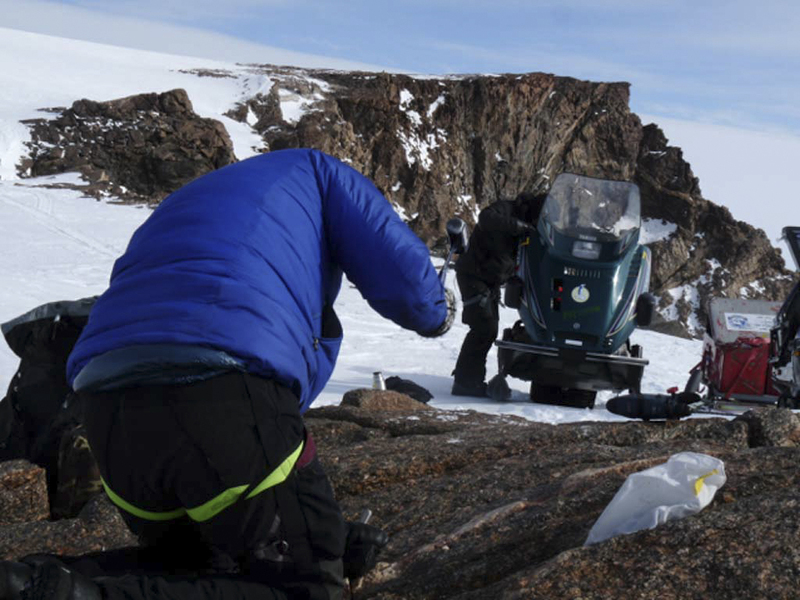 Sampling, like setting up camp, was more difficult than usual due to the cold and high altitude. We fared much better in these conditions than any of our electronic and battery-powered equipment, none of which decided to work. So we resorted to the traditional hammer and chisel to get our samples. There was something very special (almost magical) about wandering along the top of such dramatic and stunning cliffs. One of the many reasons I love this work so much! We returned to camp at around 16:00 due to deteriorating weather. 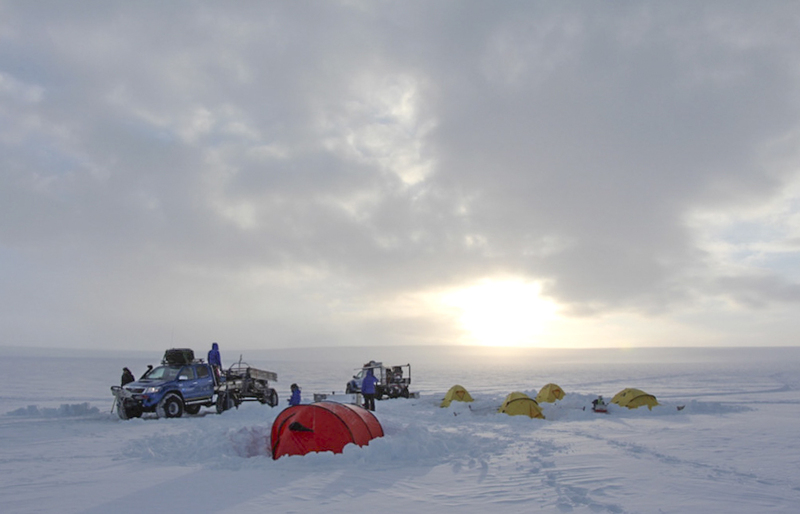 We have been so fortunate with the weather this expedition, though it is not always sunny in Antarctica! The following morning, we packed up camp and started the journey home. 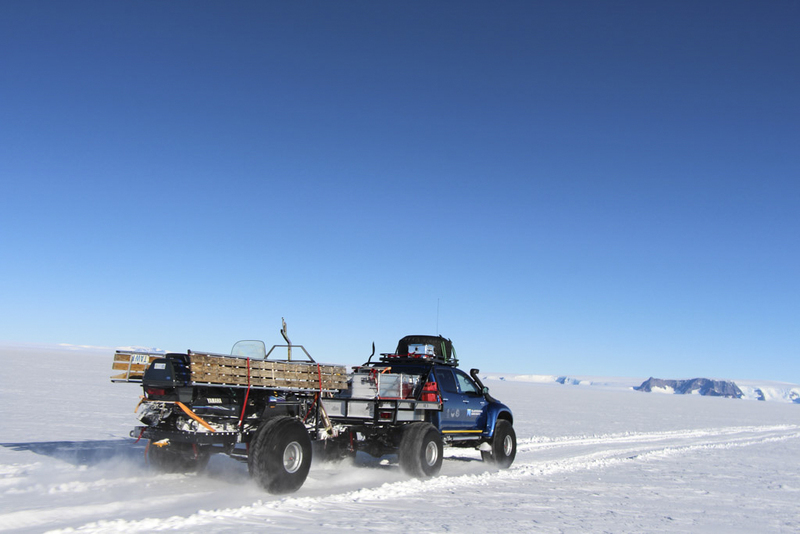 The driving is mostly very enjoyable with spectacular views all the time, be they the mountains of Milorgfjella slowly disappearing out of view, or the vastness of the ice sheet, when there is nothing to break the horizon. All in all, it was a monstrous effort to return to Milorgfjella but hopefully the data we can get from the samples collected (in compliment to what we already have from the first visit) will make it a very worthwhile effort.